Safety improvements along SW Moody Avenue, between SW Sheridan Street and Ross Island Bridge area, will close the west sidewalk and cycletrack for three weeks, Monday, July 20 through Friday, Aug. 7. TriMet and the Portland Bureau of Transportation have been closely monitoring the flow of pedestrians and bicyclists along SW Moody Avenue with the addition of MAX Orange Line trains, streetcars and buses traveling in South Waterfront. 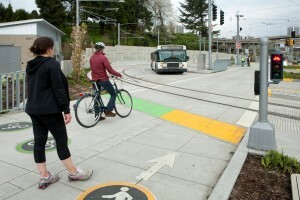 Bus operator training underway in the South Waterfront area, where many bicyclists and pedestrians travel. With the busy Collaborative Life Sciences Building and MAX and bus operator training underway, we’ve seen unsafe behavior including crossing against signals and not looking for trains coming from opposite directions. Based on those observations, adjustments will be made to further encourage people to cross the tracks safely. Also, the improvements will allow bicyclists and pedestrians to better share the space and improve access to the Collaborative Life Sciences Building and Tilikum Crossing, Bridge of the People, when it opens in September. • Pedestrians will shift to the west side of the pathway away from the traffic lanes. • Bicyclists traveling both north and south will share the section of pathway closest to the curb. Additional striping will be added to delineate how each mode shares the space. • Railings will be added around the southbound Portland Streetcar stop at SW Moody & Meade. • Some crossing signals will be adjusted for improved safety. • Sidewalk and cycletrack closed on the west side of SW Moody between Sheridan and Ross Island Bridge area. • Use sidewalk on east side of SW Moody. • Be alert as all bike and pedestrians will share the same east side pathway. • Sidewalk and southbound bike lane on west side of SW Moody closed between SW River Parkway and SW Sheridan Street. • SW Harbor Path also closed. • Use sidewalk on east side of SW Moody south of River Parkway. • The Orange Line includes Tilikum Crossing, Bridge of the People, the first of its kind multi-modal bridge in the U.S. carrying MAX light rail and Portland Streetcar trains, buses, bicyclists, pedestrians, but no private vehicles. • 446 new bike parking spaces, including 2 secure Bike & Ride facilities, at SE Tacoma St/Johnson Creek and SE Park Ave stations. • 2 Park & Rides: 318 parking spaces at SE Tacoma St/Johnson Creek Station and 401 parking spaces at SE Park Ave Park & Ride Garage. TriMet is installing 9 EV spaces with chargers. Transportation, City of Portland, Portland Development Commission and TriMet.